Do you have a problem answering the question - WHAT IS ROTARY? Perhaps this might help you answer the question when you are asked. We are 1.2 million neighbours, friends, and community leaders who come together to create positive, lasting change in our communities and around the world. Our differing occupations, cultures, and countries give us a unique perspective. Our shared passion for service helps us accomplish the remarkable. We see differently: Our multidisciplinary perspective helps us see challenges in unique ways. We think differently: We apply leadership and expertise to social issues—and find unique solutions. We act responsibly: Our passion and perseverance create lasting change. Our impact starts with our members—people who work tirelessly with their clubs to solve some of our communities' toughest challenges. Their efforts are supported by Rotary International, our member association, and The Rotary Foundation, which turns generous donations into grants that fund the work of our members and partners around the world. Rotary is led by our members—responsible leaders who help to carry forward our organisation's mission and values in their elected roles. How do we use our funds? Responsible leadership means more than just doing good work—it means making the most out of every donation we receive. ROTARY INTERNATIONAL ANNUAL REPORT 2015-2016 - Read highlights and reports from Rotary's fiscal year here. With the new Rotary year comes the all new Rotary Club Central. The refreshed RCC is the perfect way to set club goals, motivate members and record achievements. President Ian has asked all clubs to record their service hours and contributions to allow RI to have a stronger understanding of how much we are making a difference at club, district and global level. Watch the video here and login today. National Stroke Week is the Stroke Foundation’s annual awareness campaign. 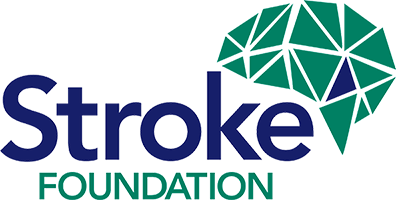 This year with the help of Medtronic International, the Stroke Foundation is focusing on delivering a grass roots campaign in regional and rural communities. Stroke kills more women than breast cancer and more men than prostate cancer. It is one of the leading causes or adult disability in Australia. More than 80 percent of strokes can be prevented. Over 4.1 million Australians suffer from high blood pressure, a key risk factor for stroke. The lower your blood pressure, the lower your risk of stroke. Bringing the spotlight on stroke in September, we need your help to reach Australians with lifesaving messages on how they can identify the signs of stroke as well as reduce their own risk of stroke. Depending on which activity you nominate, the Foundation will provide your designated contact with a detailed Coordinator Kit filled with tools, tips and ideas to assist in the planning of your clubs activity. Closer to Stroke Week a promotional kit including resources, media release, posters and merchandise will be sent to your designated contact to assist with local promotion. "One-in-seven chil dren will experience mental illness by the time they are fourteen (14). They are the State's forgotten children and Australian Rotary Health is Lifting the Lid on Mental Health and Our Kids. If you are (or have ever been). 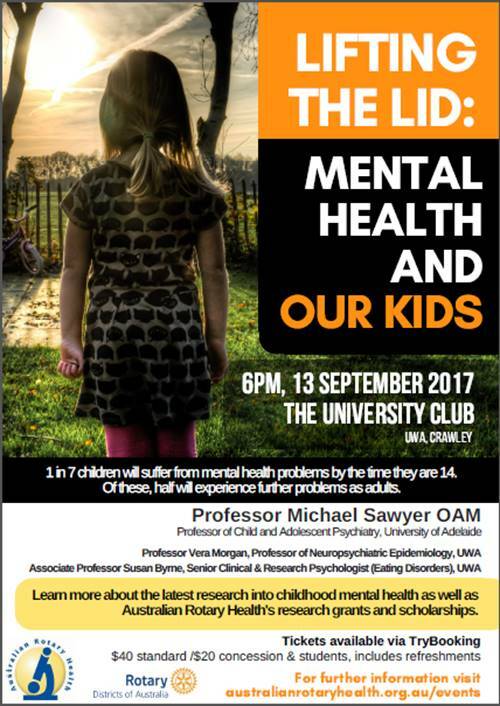 concerned about the mental wellbeing of children, come to the University of WA on Wednesday 13 September 2017 to hear the highly-regarded Professor of Child and Adolescent Psychiatry, University of Adelaide, Professor Michael Sawyer OAM speak assisted by a panel of some of WA’s top researchers in the field. Please share this wonderful opportunity with everyone who would wish to attend. To book go to - https://www.trybooking.com/book/event?eid=291252. In May 2017, a major battle commenced between the Armed Forces of the Philippines (AFP) and members of the Islamic Freedom Fighters (BIFF) who have pledged allegiance to the Islamic State of Iran and Syria (ISIS). The incident has affected residents of Marawi City. They have organised with other local partners to provide pre-positioned resources and volunteer assistance at the Balay Mindanaw DREAM Hub.